How can time-pressured academics design effective blended and online courses aligned to the Connected Curriculum? 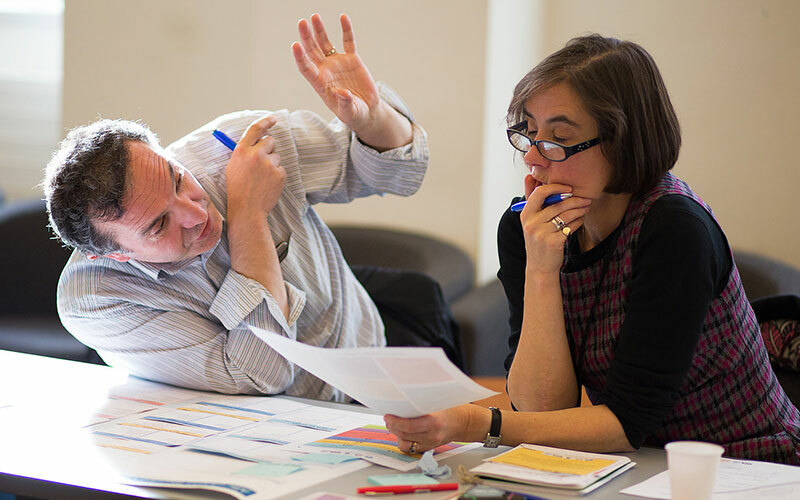 Dr Clive Young and Nataša Perović (UCL Digital Education, ISD) describe ABC curriculum design: a quick way to (re)design programmes and modules through a hands-on workshop where academic teams discuss and create storyboards of students’ activities. "ABC (Arena, Blended, Connected) curriculum design, created by UCL Digital Education, is an effective and engaging hands-on 90-minute workshop where academic teams work together to create a visual ‘storyboard’ outlining the type and sequence of learning activities (both online and offline) required to meet the course’s learning outcomes. ABC was initially created for new programmes and modules or those changing to a more online or blended format. However it has also proved remarkably effective simply to review current programmes. So far, over 60 modules have been re(designed) using the ABC method. In addition, the ABC materials have been used successfully in two other UK universities. The ABC builds on Viewpoints, a well-received 2012 JISC project that used a card-based method for curriculum design. The UCL ABC method cards integrate the powerful concept of learning types derived from the Conversational Framework model of Professor Diana Laurillard (UCL Institute of Education). This is the principle. And on the other side conventional and digital learning activities (the practice) are detailed. As the workshop progresses these are sequenced into a large storyboard sheet representing the student journey. Working together, module teams are first asked to write a "tweet-sized" description (140 character or less) of the module or programme, outlining the main outcome or unique selling point. This provides a sharp focus for the design and usually generates much lively debate. The participants also draw the shape of their course (as they envisage it at this time) on the learning types graph. They also consider the type of online and conventional learning mix. The next step is to complete a draft storyboard of the module by sequencing and stacking six 'learning types' cards. This step encourages teams to deliberate the ways different learning types can be mixed together in variety of ways to reach the module's learning outcomes. Up to this point they are only looking at an overview of learning types. Once they have made a layout of the module (programme), they turn the cards over and look at the activities that are printed on the back side of the cards. They then select conventional and digital activities they want to use in their programme, by ticking them and by adding their own activities to the cards. Once learning activities are chosen, the opportunities for formative and summative assessment of these activities are identified and marked by gold and silver stars. The final step is to review changes made and share with other module teams. As one participant said: “This process was really useful. It helps us think about the modules in their entirety. It is really good how everything maps out in a clear framework like this." Initiated as a pilot a year ago, the ABC method has proved popular and effective and has spread by word of mouth by teams who see the time advantages of using a fun, collaborative and rapid development process to address what is often seen as a difficult and daunting task. A variant has been developed for UCL Life Learning (short courses and CPD). In 90 minutes, using a game format, teams are able to work together to create a visual ‘storyboard’ outlining the type and sequence of learning activities (both online and offline) required to meet the module’s learning outcomes. To organise ABC workshop for your programme contact Clive Young (c.p.l.young@ucl.ac.uk) and Nataša Perović (n.perovic@ucl.ac.uk).